BELIZE CITY, Fri. Sept. 25, 2015–Giann Ramclam of Holy Redeemer Primary School is the Belize District winner of the Fr. Marion Ganey Quiz Competition. Second and third places went to Mikaylie Jonch of Holy Redeemer Primary School and Homayra Sarah of St. Joseph Primary School respectively. The competition was held at the Holy Redeemer Parish Hall on September 25. Despite the rain, a total of six schools were able to participate in the event: St. Ignatius Primary School, represented by Shandel Parham; Ebenezer Primary School, represented by Ashanny Flowers; St. Joseph Primary School, represented by Alanna Guerra and Homayra Sarah; Holy Redeemer Primary School, represented by Giann Ramclam and Mikaylie Jonch; Queen Square Primary School, represented by Gerald Parks; and St. John’s Vianney Primary School, represented by Marli Mclaren and Jayra Young. In the first and second round of the competition, each participant was asked three questions and awarded five points each for every correct answer. Only five participants advanced to the third round — Gerald Parks, Homayra Sarah, Giann Ramclam, Mikaylie Jonch and Marli Mclaren. At the end of the third round, an elimination should have taken place, but all the students were doing well, and so all five advanced to the fourth round. At the end of the fourth round, three students tied for third place and two tied for first place. And so the competition continued to a fifth round, where the students participated in a tie breaker. The students answered questions on credit union affairs such as which Jesuit priest introduced the Credit Union League to Belize (Fr. Marion Ganey), during which period the credit unions hold their annual general meeting (April 1 to May 31), who was the only director of the Holy Redeemer Credit Union elected to the House of Representatives in two successive elections (Jane Usher), and who were the first three members of the Holy Redeemer Credit Union (Carmen Canton, June Bolton and Hazel Anderson, who each opened their account with a 25-cent deposit). Holy Redeemer Primary School was the winner of both 1st and 2nd prizes and received $1,000.00, a laptop and printer (the 1st place prize), as well as $750.00 and a printer/scanner (the 2nd place prize.) Meanwhile the 1st place student, Giann Ramclam, received a Samsung Tab 4, and Mikaylie Jonch, who was the second place winner, received an android tablet. 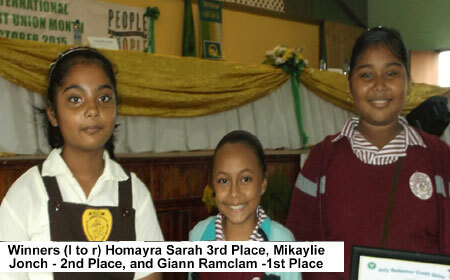 The student who was the third place winner, Homayra Sarah, received an MP music/video player, and her school, St. Joseph Primary School, received $500.00 and two fans. The Fr. Marion Ganey Quiz Competition in the Belize District was sponsored by Holy Redeemer Credit Union. Quiz competitions were held in the other districts as well. The Credit Union League held the competition in order to “foster financial literacy” among students. According to Clement Usher, president of the Belize Credit Union League, the National Fr. Marion Ganey Quiz Competition will be held on October 16th, at the Parish Hall. The month of October, Usher noted, is observed as Credit Union Month, and International Credit Union Day will be observed on the third Thursday in October — October 15.